Campbelltown Rotary Observatory is owned by Western Sydney University and is located in the appropriately named Milky Way, behind the University in the new residential suburb of Macarthur Heights. It was founded by its Director, Dr Ragbir Bhathal and was constructed with considerable support from Campbelltown Rotary and other organisations. It was originally opened on 15th July 2000. In 2013, the Observatory was temporarily closed while the hill it was then situated on was bulldozed to make way for the new housing estate. 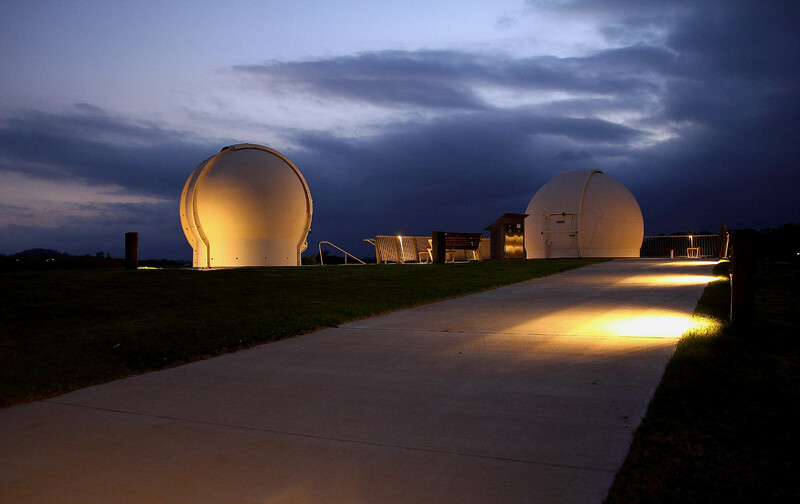 2015-11-23 Campbelltown Rotary Observatory twin domes. In 2015 it was reopened about 150 metres away from its original location. It is now closer to the University and is a stunning visual feature at Macarthur Heights. Public observing sessions are conducted over the winter period each year, in collaboration with Macarthur Astronomical Society. For details go the Macarthur Astronomical Society website. 2015-01-15 Campbelltown Rotary Observatory – steps up. 2016-05-14 Campbelltown Rotary Observatory – steps down from the Observatory to the “Gates of Light” sculpture. 2016-05-14 Campbelltown Rotary Observatory: Moon in the clouds. 2015-12-05 Dome-1 in the sunset. 2016-05-14 Campbelltown Rotary Observatory domes in white light. 2015-12-05 Dome-2 on a public night in red light. 2015-12-05 Public Night: MAS members setting up telescopes next to the Observatory. 2016-05-14 Campbelltown Rotary Observatory domes in red light. 2015-11-23 Campbelltown Rotary Observatory in white light. 2015-12-05 The Domes: Public night, steps in red light. 2015-11-23 Campbelltown Rotary Observatory plaque. 2015-11-23 Campbelltown Rotary Observatory domes. 2015-11-23 Campbelltown Rotary Observatory Dome-1. 2015-01-15 Campbelltown Rotary Observatory day view from Milky Way. 2015-12-05 The Domes on a public night: Dome-1 with seat. Campbelltown Rotary Observatory: Old and New locations. The Observatory in 2009, when it was in its original location. Viewed from Narellan Road.